Starting with the definitions of momentum and kinetic energy, derive an equation for the kinetic energy of a particle expressed as a function of its momentum. 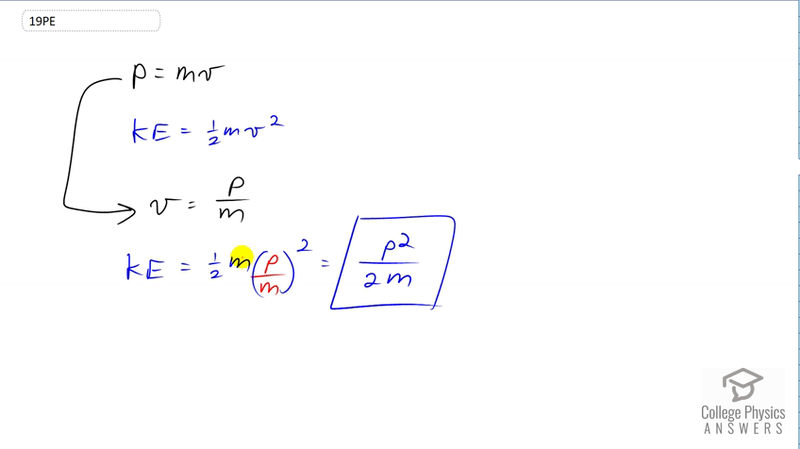 See the video solution for the derivation for kinetic energy in terms of momentum and mass. This is College Physics Answers with Shaun Dychko. We're going to derive an expression for kinetic energy in terms of momentum for a particle. There are two ways that you could think of doing this. One is the way that I think they intend for you to do it which is to end up with this momentum squared over two times mass formula. So let's cover how I got this first of all. So momentum is mass times velocity and kinetic energy is one half mass times velocity squared. We'll rearrange the momentum formula to solve for i>v so that we can make a substitution in place of v in our kinetic energy formula. So we substitute momentum divided by mass in place of v here and the momentum gets squared and the denominator also gets squared but you have one mass canceling here and so it's just mass to the power of one on the bottom and there is this one half which I wrote as a two on the bottom there. So that's one way to do things. The other way to do things would be to rearrange this momentum formula and solve it for mass instead and say that it's momentum divided by velocity and then you could substitute that in for m in the kinetic energy formula. You'd have one half P over v times v squared. So I've replaced m with P over v here and this would work out to P v over two which is correct but it isn't quite what they're looking for because if you're going to -- they want it in terms of momentum and the particle. The particle is sort of represented by its mass and so they're looking for an expression that has momentum and mass in it, not an expression that has velocity in it. I think that is the best I can say, yeah. There we go, momentum squared over two m.